These paintings took a rather circuitous path in finding their rightful owner. Originally I was commissioned to do a set of koi fish for my friend Tracy, but I was having a hard time coming up with the right image for them. As I’ve said in the past, some paintings come in a matter of seconds, some take years. Back in June 2007 I was heading down to San Francisco (I’m normally there once or twice a year visiting my sister) and decided to take a jaunt out to the Japanese Tea Gardens in the Golden Gate Park while I was there to gain some insight. I figured what better place to find an ample supply of koi fish ponds than a Japanese Garden. I envisioned getting photos of hundreds of different koi fish in a feeding frenzy, giving me ton of photographic opportunities for the inspiration I needed to complete Tracy’s painting. How dismayed I was to discover that in the numerous ponds that adorn this 5 acre park…I spotted all of about 3 koi fish. In total. Yep. Nowhere near the 100s I was hoping for. Three bloody koi fish in the entire park. More than a bit miffed – I suddenly wanted my five bucks back. Nonetheless, I meandered through the park making the best of it. As it turns out, fate had other plans for me, and for my next painting. As I continued through the gardens, I came across the large bronze Buddha, cast at Tajima, Japan in 1790. I was at once completely and utterly awestruck. Why wouldn’t I be? 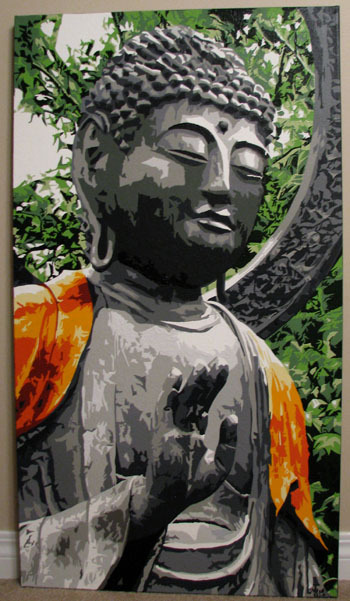 I am a Buddhist of course. While I’ve known I’ve been a Buddhist since I was about 8, I didn’t officially become one (“seek refuge”) until about 7 years ago (Tibetan Lama’s are a bit of a rare commodity in Calgary). I spent a good half an hour taking photos and basking in the essence of this staggering sculpture and enjoying the enlightenment and inspiration it was emitting back at me. I can’t remember exactly when I decided to turn these photos into a set of 3 paintings. It might have been that very moment I first laid eyes on the statue, or perhaps when I returned and downloaded the 100 or so photos I took. Regardless, I got to work on turning the encounter into a set of 3 paintings. I’d drawn out the first 2 and started work on them, but as painting progressed, so did a growing disconnect between myself and the painting. They weren’t turning out as I’d planned. 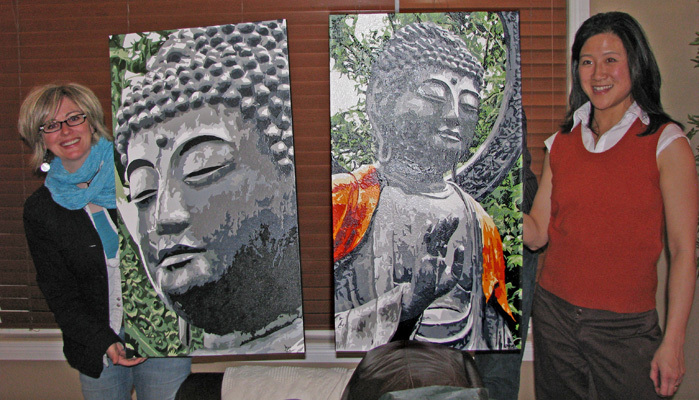 I think it is because I was planning on putting them in my livingroom to replace the original set of 3 Buddha’s I’d done (which I had quickly outgrown and wanted to take to a different level), but they just didn’t seem to “fit” in my livingroom. They were subconsciously telling me they weren’t destined for my walls, but I didn’t know whose walls they were meant for. I’d painted about 25% of each of them when I stopped. Life had become a bit chaotic in the background, and I wasn’t finding painting pleasurable at that time. I needed to take a break. So the paintings sat, unfinished, in my art studio for the next year and a half (and in that time I came up with a better idea for my living room). Cut to December 2008 when I had my friend Tracy over for a visit. Her walls were still bare, awaiting my art work which was not forthcoming. It had been a while since she’d been to my place and I was showing her my art studio. It was there she saw my two Buddhas, sitting unloved in the corner. Tracy immediately fell in love with them, and stated right then and there she wanted them, and would take them as is, even though they were only 1/4 completed. Ironic when you consider I came across these while on a pilgrimage for a completely different painting for her that never transpired. 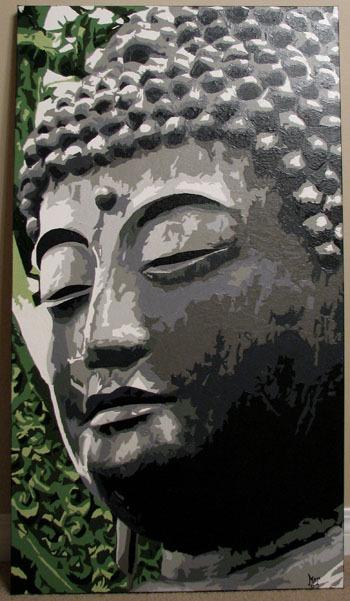 The next day we both ended up at a mutual friend’s Christmas party, and she again mentioned the Buddha’s and how much she wanted them. Then I knew she was serious. I said I’d have to come over to her house and see where she wanted them, and hopefully seeing where they would reside I would find the connection to them I needed to complete them. It worked. I was reconnected and started working on them over Christmas, and completed them with 2 hours to spare before I delivered them to Tracy on March 6, 2009. As the proverb goes, you often meet your fate on the road you took to avoid it.